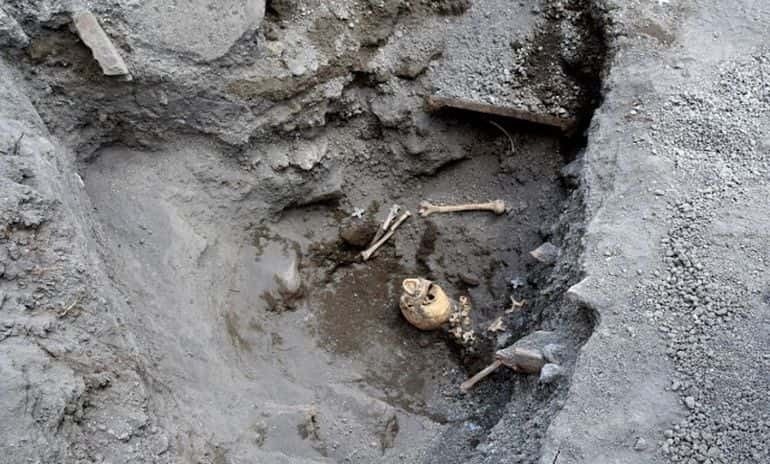 Back in May, archaeologists working in Pompeii, Italy made an interesting discovery: the skeletal remains of a man who, they thought, had survived the catastrophic eruption of Mount Vesuvius in circa 79 AD. At the time, it was believed that a flying stone block had hit the man as he fled, leading to his death. However, in the month since the discovery, new insights have surfaced that, in turn, point to an entirely different cause of death. 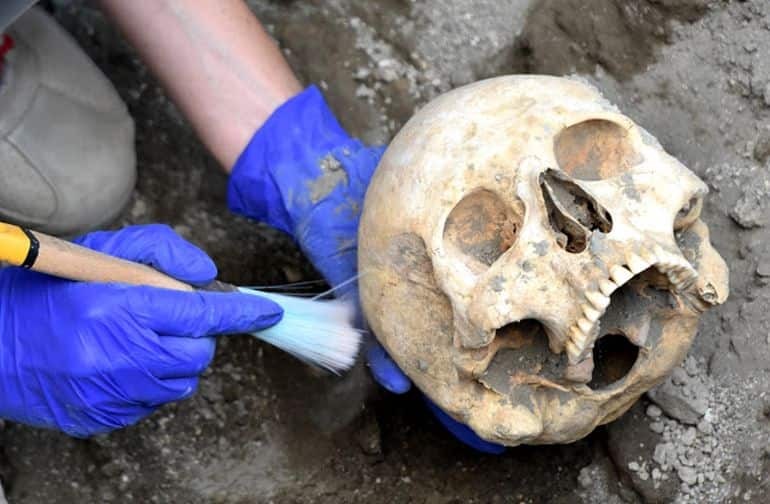 The archaeologists’ initial findings were based on the presence of a stone block right next to the lower part of the victim’s skeleton. 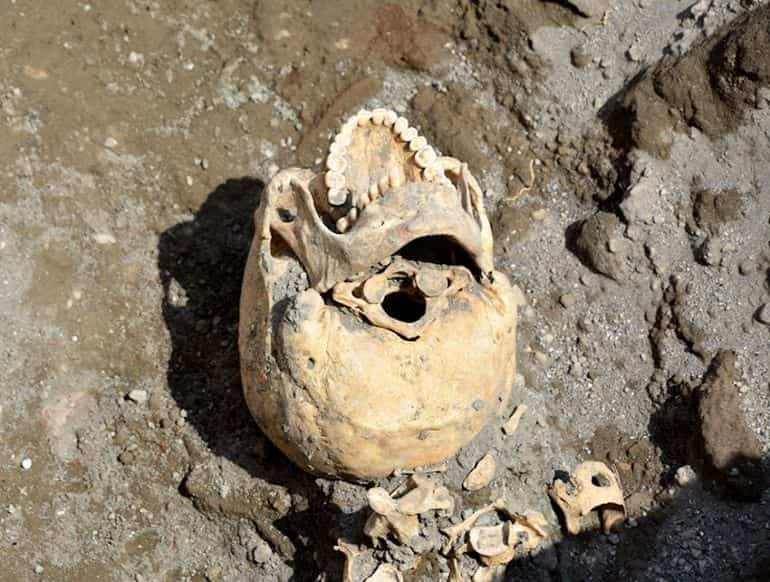 In photos of the excavation site, the body appeared as though pinned by the huge rock. The team, therefore, inferred that the block had severed the man’s body, smashing the upper part in the process. Upon further analysis of the site, however, the researchers have unearthed the missing parts of his upper body, including the upper limbs, thorax and the skull. 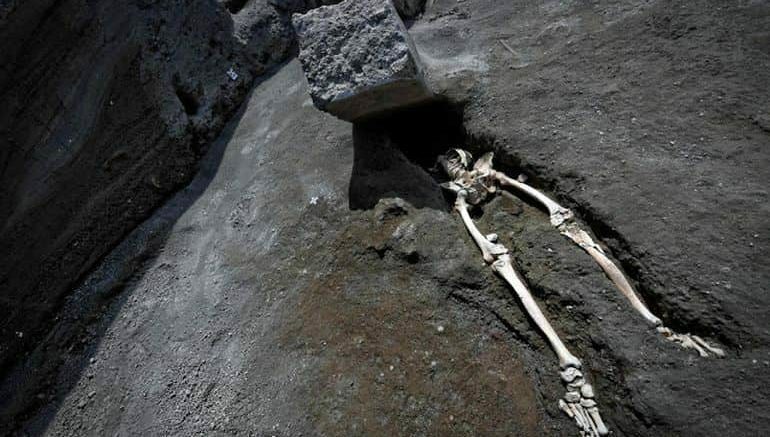 Based on their new observations, they announced earlier this week that the man’s death was not caused by the stone block and was instead the result of asphyxiation. Essentially, the pyroclastic flow – a fast-moving current of hot gas and lava discharged by a volcano – was what killed the ancient man. The block of stone, as per the researchers, was likely a door jamb that had broken away from the main structure during the eruption of Mount Vesuvius. At the time of his death, the man was at least 30 years old. The presence of lesions on the tibia point to a bone infection that probably caused him to limp, thus making escape more difficult. The identified skeletal remains consist of the upper part of the thorax, the upper limbs, the skull and jaw. Currently undergoing analysis, they display some fractures, the nature of which will be identified, so as to be able to reconstruct the final moments in the life of the man with greater accuracy. 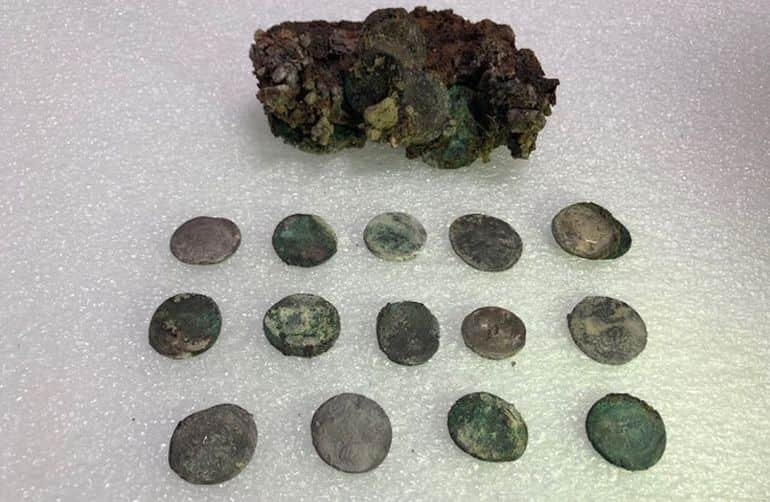 In addition to the ancient skeletal remains, a small purse containing 20 silver and two bronze coins has been discovered at the site. The deceased, the team stated, was found clutching the purse close to his chest. Worth enough to provide for a family of three for two weeks, the coins are currently being examined by experts. Pompeii, the ancient Roman town-city near modern Naples, boasted an assortment of baths, houses, graffiti, frescoes and even agricultural produce. But more than any of these avenues, the city is best known for our fascination with disaster for over 400 years, after its rediscovery way back in 1599 AD. In fact, the site of Pompeii has been a popular tourist destination for over 250 years – thus merging an unfortunate episode of history (entailing the Vesuvius eruption) and the innate level of human curiosity. However, beyond just the ‘popular’ impact of the disaster, there has always been the historical scope of the disaster with its fair share of poignancy. 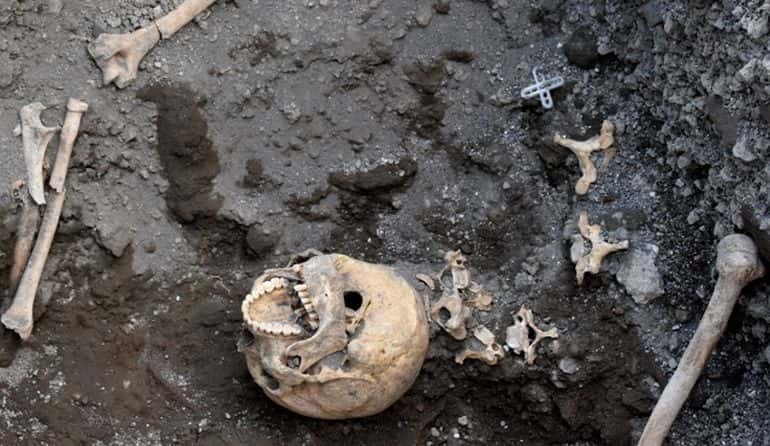 Pertaining to the latter scope, archaeologists recently unearthed the skeletal remains of an 8-year-old child victim who unsuccessfully tried to seek shelter from the noxious volcanic ash and smoke belched out by Vesuvius. The remains were discovered inside the ruins of the Central Baths complex. According to the researchers, the terrified child probably wanted to take refuge inside the thermal bath complex after hearing the ominous rumble from the Vesuvius eruption. The crouching position of the skeleton reinforces this hypothesis. However, as opposed to a few numbers of fatalities caused by falling debris and structural segments, the young Pompeiian was possibly killed by scorching ash (also known as pyroclastic flow) that engulfed the ancient Roman town. In a similar finding, researchers came across the remains of an ancient racehorse in May. The plaster cast of the horse, found at the excavation site, revealed how it lay on its left flank during the time of expiration.